#WordEyeHeard: Meek Mill’s Court Clerk Asked Him for Money! The clerk of court where Meek Mill was sentenced for violating his probation, slipped him a note asking him to pay her son’s college tuition! TMZ has obtained a note written by Wanda Chavarria and addressed to Mr. Williams (Meek’s real names is Robert Rihmeek Williams) during his probation violation hearing. 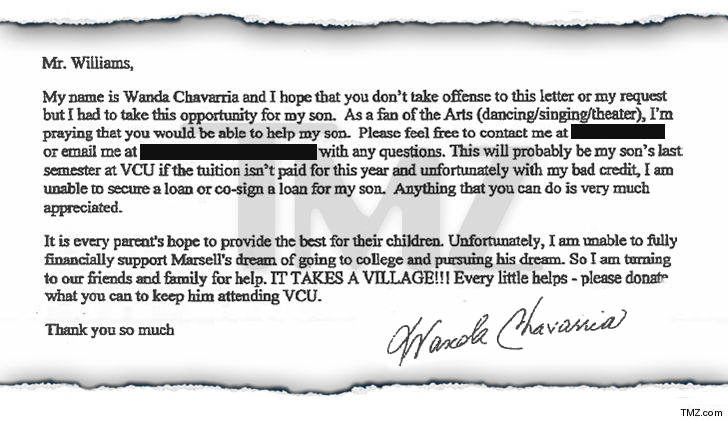 Chavarria says she has bad credit and can’t scrape together money for her son’s tuition for his last semester at Virginia Commonwealth University. Chavarria tells TMZ she did indeed slip Meek the note during the hearing, adding the judge didn’t know about it. She says since Meek’s from Philly and so is she, she thought he might do her a solid. Chavarria says Meek didn’t give her any money, but her son stayed in school and will graduate in May.